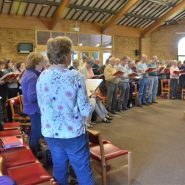 In 2015 we held our first singing day bringing together members from across all our groups to sing Fauré’s Requiem. It was the first time many of our singers had had the opportunity to sing music from the standard choral repertoire and it was so successful we ran another one last year looking at The Armed Man Suite by Karl Jenkins and a couple of spirituals by John Rutter. Our website is always being updated, so please let us know if you spot any errors or problems, we'd very much appreciate it. We welcome any feedback you may have!